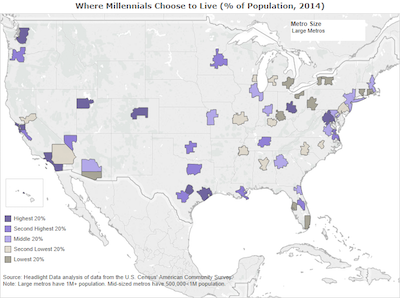 Recently released data from the U.S. Census Bureau’s American Community Survey illuminates which large metros are host to the greatest percentage of adults aged 25-34, commonly known as the Millennial Generation or Generation Y.
Millennials constitute 13.5% of the U.S. population. Among large metros, the highest percentage of millennials is found in Austin (17.5%). Salt Lake City (16.3%), San Diego (16.2%) and Seattle (16.0%) follow. Other large metros with a high share of millennials are Denver, San Francisco and Washington DC. 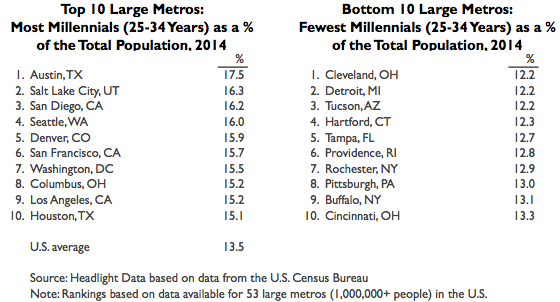 The large metros with the lowest percentage of millennials are Cleveland (12.2%), Detroit (12.2%) and Tucson (12.2%). 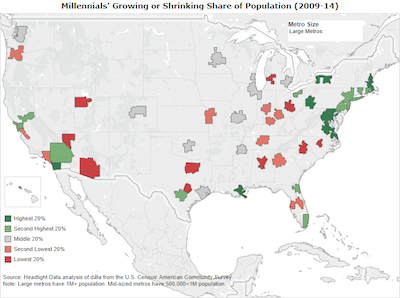 Hartford, Tampa and Providence also have a low share of millennials compared to other large metros. From 2009 to 2014, millennials’ share of the U.S. population remained constant. 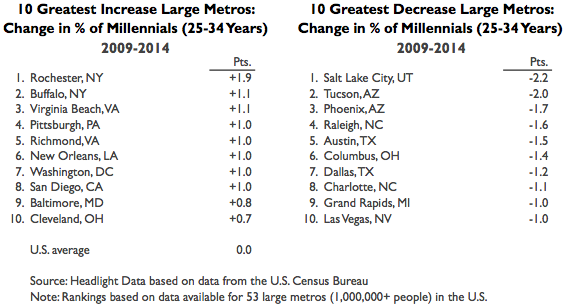 The large metros with the greatest 5-year increase in the percentage of millennials are Rochester (+1.9 pts. ), Buffalo (+1.1 pts.) and Virginia Beach (+1.1). Pittsburgh, Richmond, New Orleans, Washington DC and San Diego also increased at least 1 percentage point. Salt Lake City (-2.2 pts. ), Tucson (-2.0 pts.) and Phoenix (-1.7 pts.) had the greatest decrease in the percentage of millennials from 2009 to 2014. Raleigh and Austin also decreased at least 1.5 percentage points.